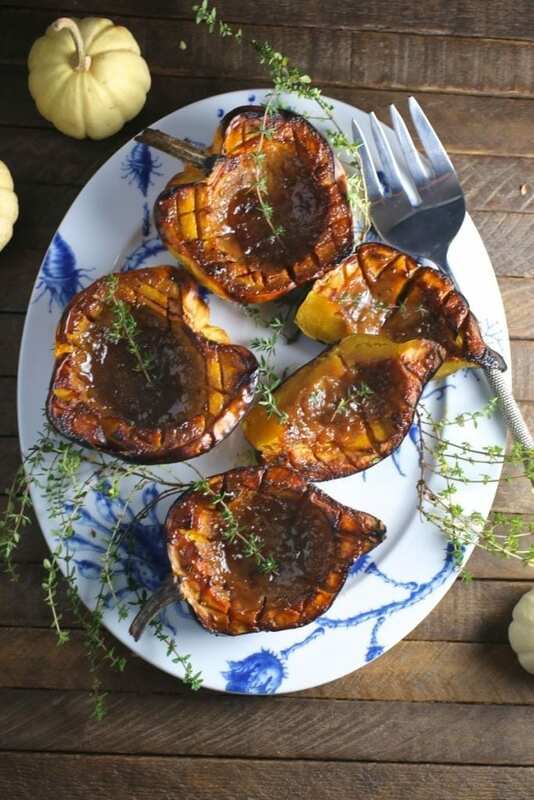 Acorn squash easy-baked with a brown sugar and mustard glaze. Simple, tasty and nutritious. 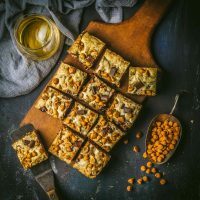 This recipe just screams autumn! I fully admit that around this time of year I go a little squash crazy (examples: mashed with mascarpone, curried in soup, curried in another soup, in pasta with bacon, in farro salad). 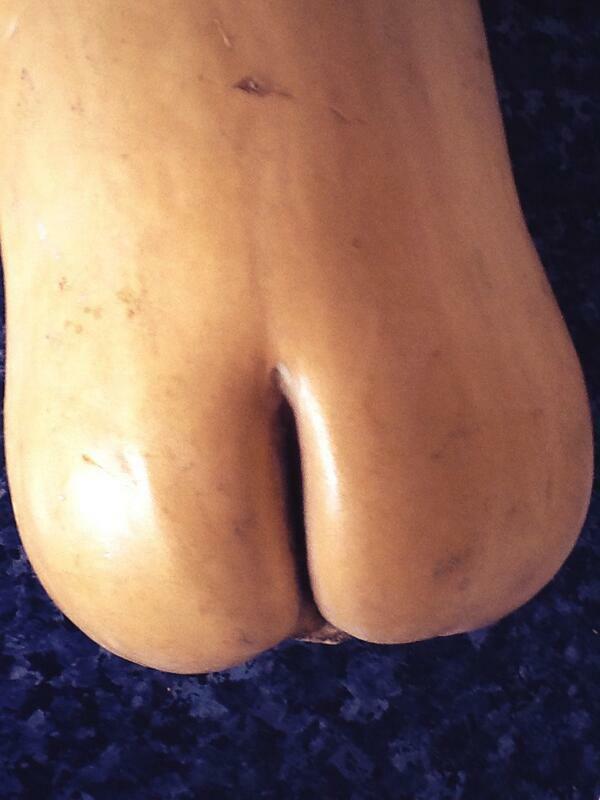 I tend to focus my obsession on the butternut variety (it’s just asking for it. I mean look at those curves!) but I have plenty of madness left for my other favorites like delicata, kabocha and the wonderful acorn. Acorn squash. The green is most common but new varieties, like this variegated golden are becoming popular. What I love about acorn squash in particular is that it’s very mildly flavored and extremely easy to cook. You could basically whack it in half, rub the flesh with a little olive oil, salt and pepper and simply roast it and it would be delicious. I like to go one step further and give it a bit of a glaze. 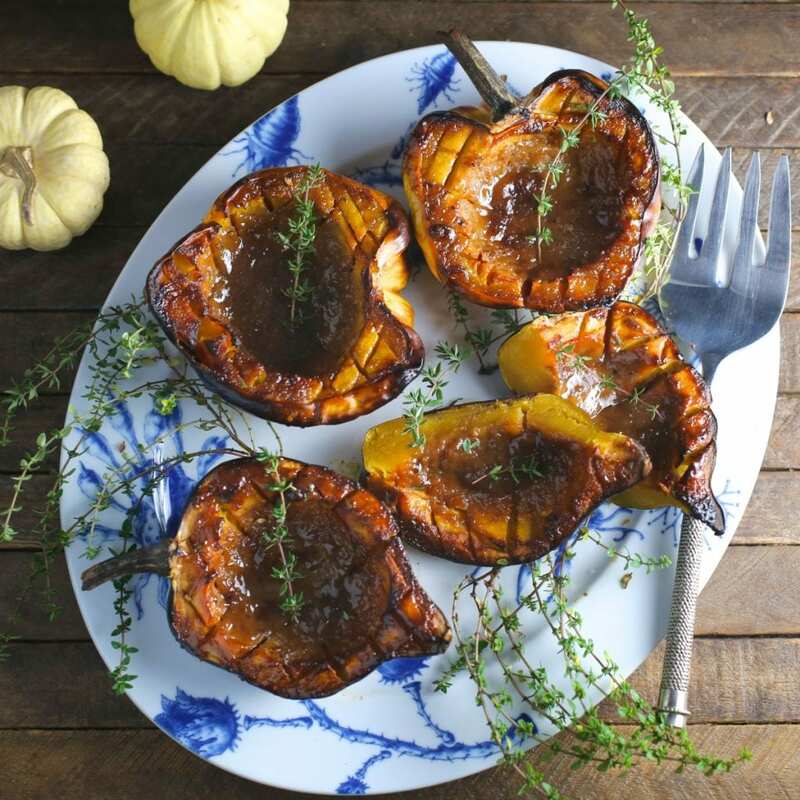 The sweetness of brown sugar (or maple syrup) pairs extremely well with squash and you’ll find it in a lot of recipes, including this one. But on it’s own I find the sweetness can be a little one note so I like to cut it with some savory flavors like garlic and a bit of Dijon mustard. The sweetness still comes through, it’s just a bit more interesting. 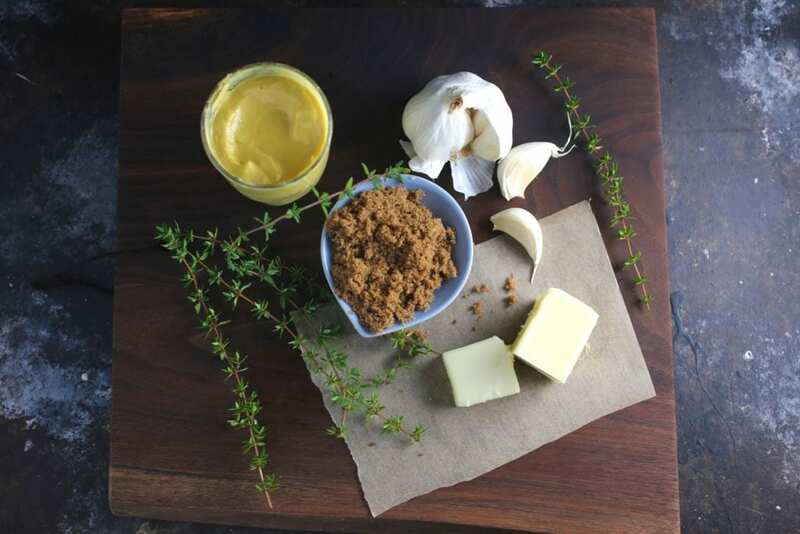 Glaze ingredients: Dijon mustard, garlic, butter, brown sugar and optional herbs. 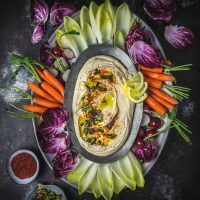 This recipe is one of the most delicious and easiest Thanksgiving side dishes we’ve ever made but we also make it all the time, just for dinner with a big salad, roast chicken or pork chops. It takes a little while in the oven but the prep takes just a few minutes. Once it’s roasting, you can pretty much forget about it (no turning, checking, basting). It’s actually really hard to overcook. It will just keep getting more brown and caramelized until you pull it out. You can undercook it though so make sure to leave enough time. Honestly the hardest part of making this recipe is cutting open the squash. It can actually be quite difficult but use a very sharp chef’s knife and take your time. I find it easiest to press the tip of the knife in and then pivot down to make a long slit, repeating as needed. If the halves wobble or sit unevenly, shave a small part of the very bottom off with a sharp knife. Cut a crosshatch pattern in the flesh or just poke with a fork. Divide the glaze evenly and rub a bit on the rim. When you first pull it out of the oven, you’ll notice a pool of delicious molten brown butter/sugar sauce in the well. You can serve it while it’s still liquid or set it aside and wait about 30 minutes until the squash absorbs it. Either way, it’s fantastic. 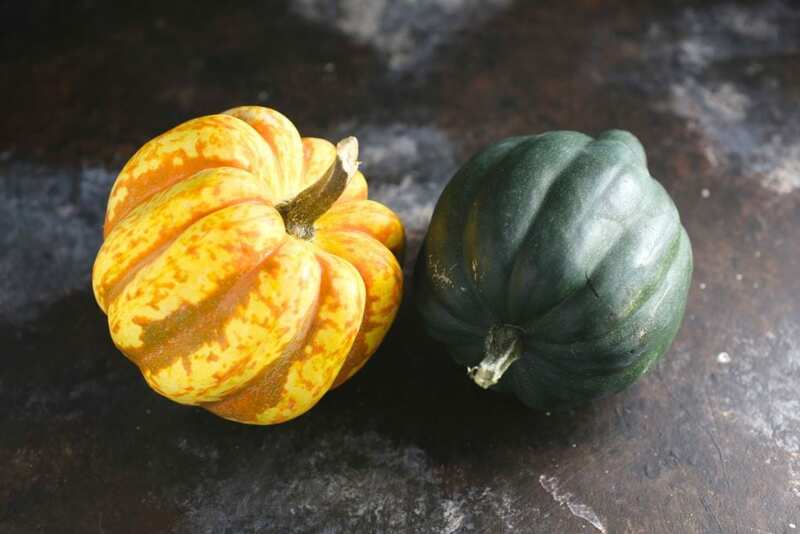 For the standard green variety, choose a squash with a dull green rind; if it’s turned orange it will have tough and fibrous flesh. 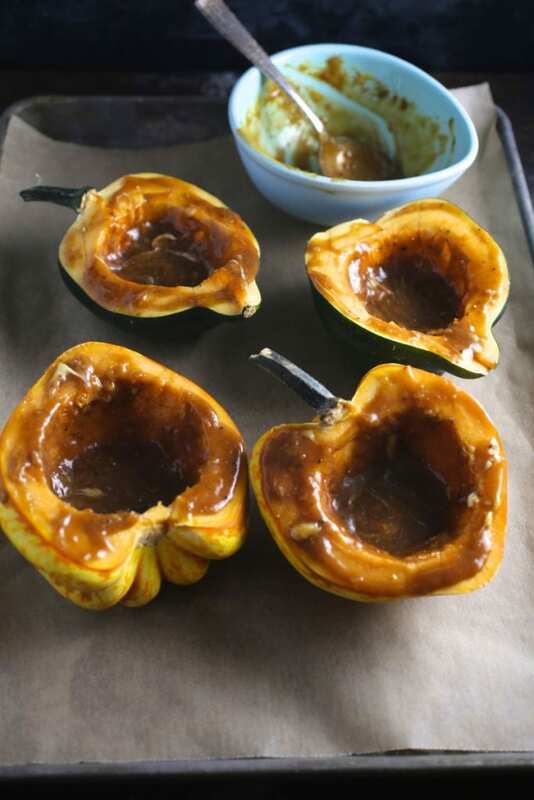 The glazed squash can be made several hours or even a day ahead. Pop them back in a 325ºF / 260ºC oven for 10-15 minutes until hot. These are great stuffed with wild rice and sautéed vegetables for a more substantial vegetarian entree. This glaze is very similar to our all time favorite chicken dish, Maple-Mustard Baked Chicken Thighs. Preheat oven to 400°F (200°C). Prepare a baking sheet with foil or parchment. In a small bowl, mix together butter, brown sugar, mustard, garlic, thyme (if using), and a generous pinch of salt and pepper. 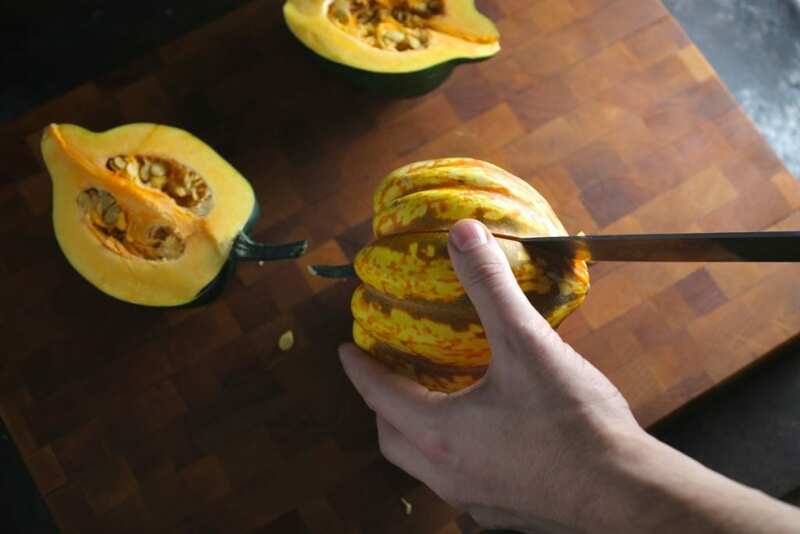 Using a sharp, sturdy chef's knife, carefully cut the acorn squash in half, from stem to tip. (I find it easiest to press the tip of the knife in and then pivot down to make a long slit, repeating as needed). 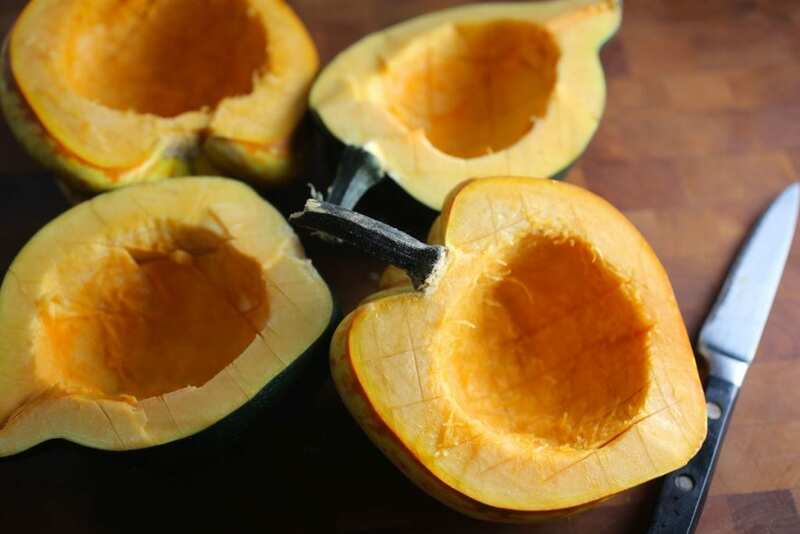 Scrape out the seeds and stringy bits inside each squash half using a spoon, until the inside is smooth. 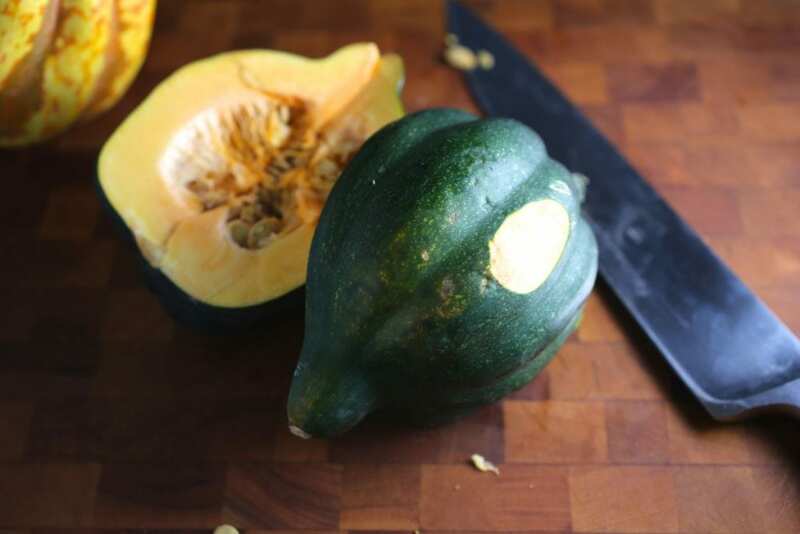 Using a sharp paring knife, score the insides of the acorn squash halves in a cross-hatch pattern, about a half-inch deep cuts (alternately, you could poke some holes all over with a fork). If the halves wobble or don’t sit evenly, shave a small part of the very bottom off with a sharp knife. Place the squash halves cut side up on the prepared baking sheet. Split the butter mixture evenly between the 4 halves and rub it around with the back of a spoon, including the rim. Place in oven and after 45 minutes, scatter a thyme sprig or two over each half (if using). Bake for another 15-25 minutes until nicely browned around the edges (60-75 minutes, total). The flesh should be very soft and cooked through when you poke it with a fork. Remove the tray from the oven and let cool for a bit before serving. There will be a delicious buttery sauce in the well which will soak in as the squash sits. 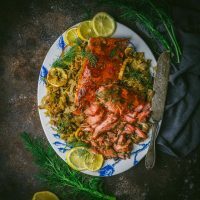 If you want to cut it into wedges or slices, cook it at least 30 minutes ahead and slice when the sauce has been absorbed. Oven time on Thanksgiving day can come at a premium. 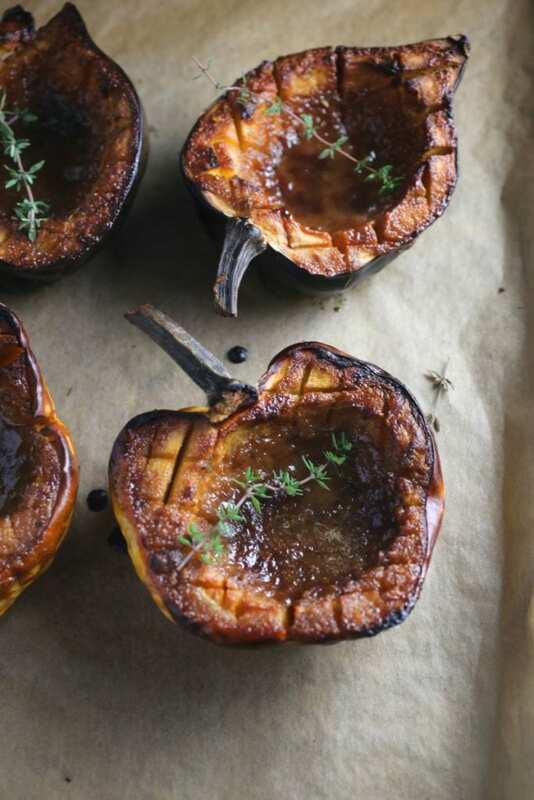 If I cook the squash a day ahead of time, what are your recommendations for reheating the squash the following day? I usually lay it back on a foil-lined sheet tray (to catch any glaze drips) and pop it in a 300º-325ºF oven for about 10-15 minutes. It’s pretty versatile so if you have other things heating at the same time, it should be fine on whatever temp the oven is at (as long as it’s not very hot, like above 350ºF. It’s also very good at warm-ish room temperature so even if it’s been out of the oven for 30 minutes or so, it will still be great. I first saw your post on Reddit’s EatCheapAndHealthy, and I’m super impressed by your photography skills. 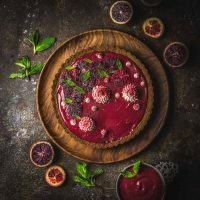 This recipe looks so simple and yummy! Hi Elaine, Thanks so much! Hope you like the squash if you end up making it! Hi there. What was supposed to do with other half of the butter? It’s actually a typo which I’ll fix asap. The butter mixture should be equally divided between all 4 halves. Thanks! I ended up using the leftover butter on the leftovers. I scooped out everything and put it in a small casserole dish and topped it with the leftover butter. So yummy. Thanks for the great recipe!